Each Easter Eve I look up into the sky and imagine the millions of caregivers from all around the world. Each year at this time I look up at the sky at night and imagine all of the caregivers from around the world. As my eyes adjust I see more and more stars. First, hundreds, then thousands, and finally millions. Each star represents a caregiver. We have readers from all over the world. Readers from over 200 countries. The United States, Canada, the U.K., from far off places like Australia and New Zealand. Readers 10,000 miles from Delray Beach, Florida. If you are patient you will see more and more stars as your eyes adjust. I also looking closely at the spaces between those stars. I call this place - The Blue Nowhere. This is where you find the persons living with Alzheimer's and dementia. There are stars in the Blue Nowhere but you need a telescope to see them. Think about this. In all their are an estimated 77 million caregivers and dementia professionals around the world. I think about caregivers every day. I know how they feel. I understand. I am an Alzheimer's caregiver. I feel honored to be among the many millions of caregivers. It is not easy sitting in the front row but we do it. Many of us often feel lonely. But at the end of the day I know one thing. I admire and respect each caregiver whether I know them or not. We care. Most people will say they care. But we, the caregivers, often learn a harsh lesson - not every one genuinely cares. 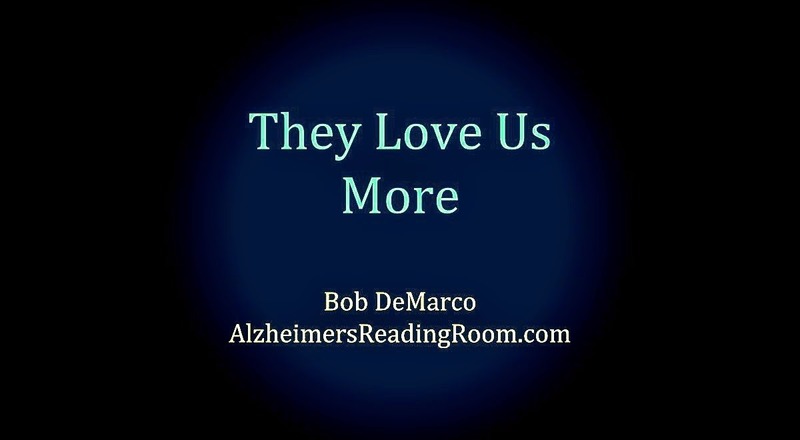 We know this because those who are close to us often abandon us when Alzheimer's strikes. We learn a very harsh lesson. If you haven't done it, it is hard to understand or even imagine what it is like to take care of a person who needs us so much. A person living with Alzheimer's. When they can't see us - they call out our name. When we go out, they asked repeatedly, when are we coming back, where did we go? They rely on us so much they cannot stand to be without us. It is really very simple. Think about it. Unconditional Love. What is a Memory Care Facility? 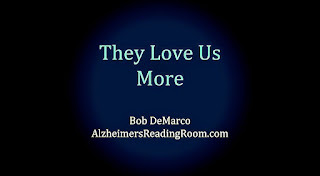 'The Alzheimer's Reading Room contains more than 5,000 articles and has been published daily since July, 2009. *** Unconditional love is known as affection without any limitations or love without conditions. *** Purpose the reason for which something is done or for which something exists. Having as one's intention or objective. *** Happiness is a mental or emotional state of well being defined by positive emotions ranging from contentment to joy. Happy mental states also reflect judgement by a person about their overall well being. 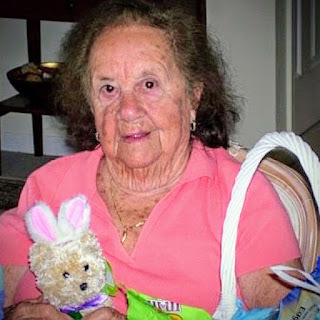 *** Caregiver is a person who gives help and protection to someone who is sick or in need. *** Love an intense feeling of deep affection. My husband and I care for my 97 year old mother in our home who has dementia and late onset Alzheimer. She came to live with us over 10 years ago. My biggest struggle is when I have feelings of anger, regret for taking this on and self pity when there are things we are unable to do because of her. I know it's not her fault, I just feel awful for having these feelings and wishing I had never gotten us into this situation. So true. From first hand experience. I think fear of the unknown is the biggest factor. It's ok to be afraid. Imagine how afraid the person with Dementia/Alzheimer's is or was, especially if that person was aware of what is happening to them. Cross Sad but so so true. We do learn some hard lessons but I wouldn't trade them for nothing. My husband threaten to leave me because I spent to much time with my dad and mom with my dad has dementia but I wasn't going to let my mom go thru it alone. It was bob and his room and stories that kept me going and knowing that I was doing the right thing. To see my dad smile every day or for my mom to get to see him or hear him tell her he loved her was all I needed to know that my dad loved me no matter how harsh he was. This is sad but true. I know because I took care of my mother.